Untitled, 1980; oil on canvas, 76 x 76 in. 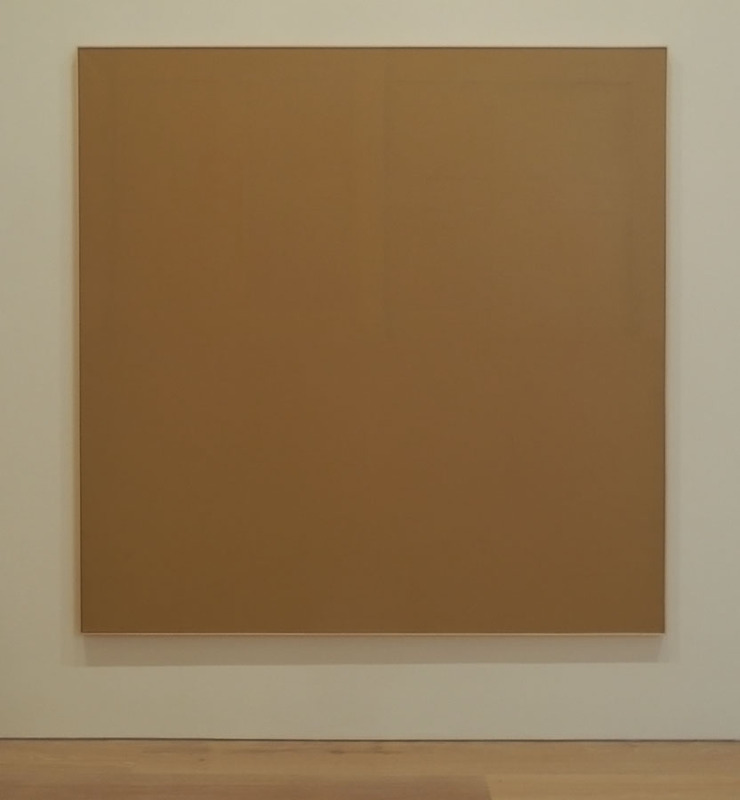 The paintings of James Bishop, in his recent show at David Zwirner Gallery, require long and careful attention. Their architectonic structure emerges slowly from the subtly brushed and pooled layers of paint. 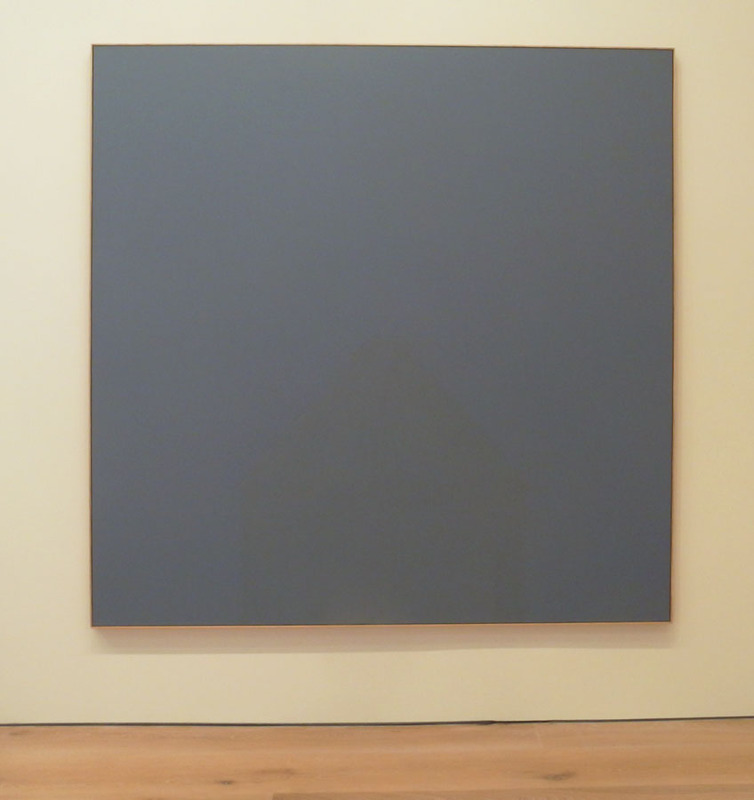 In this they remind me of the black paintings of Ad Reinhardt which are similarly reticent. 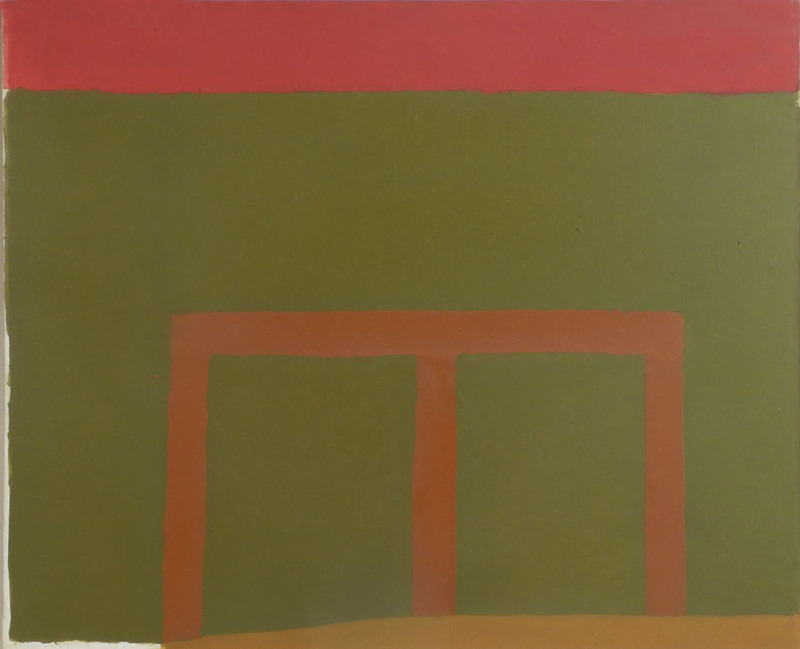 If you enlarge this photo, a detail of Untitled, you will see the exquisitely balanced color relationships, bringing a gentle light forward; the horizontal band is slightly brighter than the vertical, indicating a delicate shift in the space. The structure seems to be part of the canvas itself; when I was looking at the show, I kept equating the depicted architecture with the architecture of the canvas stretchers. 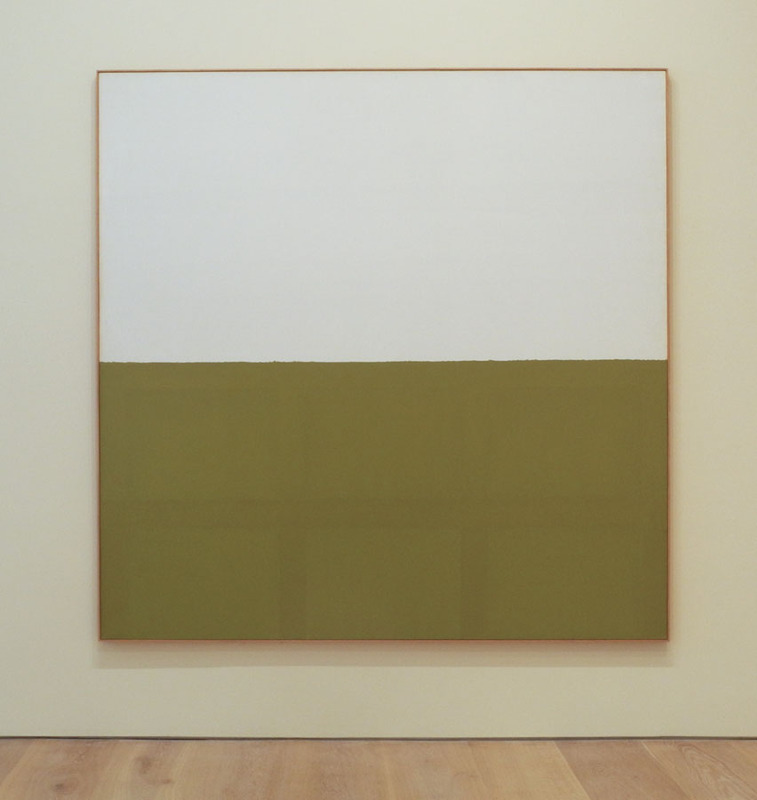 I like this: it moves the space of Bishop's paintings from their physical selves, human-sized, outwards to monumental architectural constructions. Maintenant, 1981; oil on canvas, 76 x 76 in. Embedded within a beautiful gray is the slightly warmer color-shape of a childlike house. Bishop's colors turn paint into atmosphere, and into a particular quality of subtle light, where things must be espied through dimness. 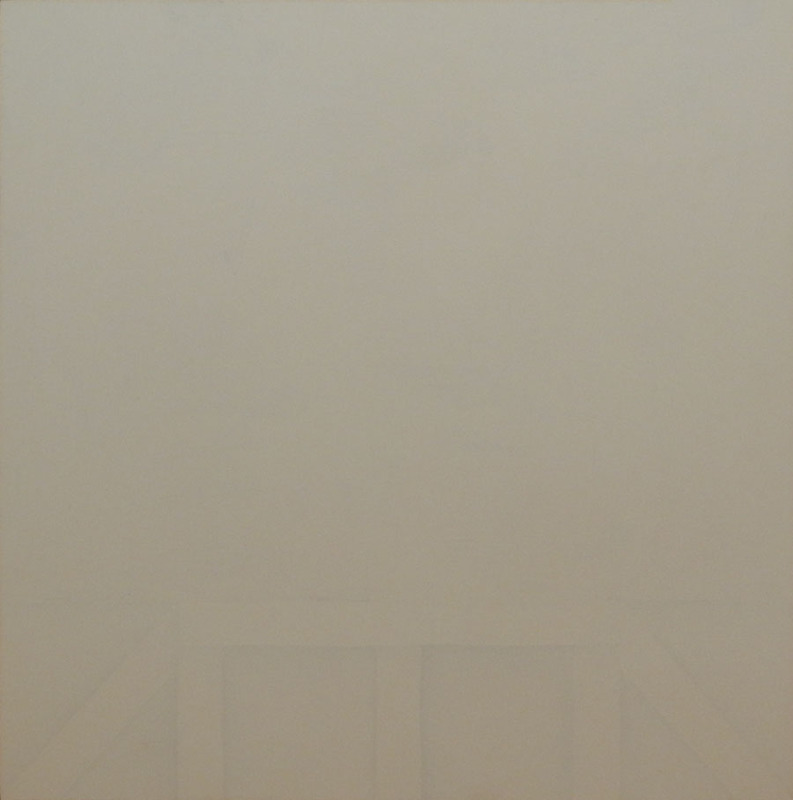 Closed, 1974; oil on canvas 73 1/8 x 73 3/8 in. In Closed, the light is golden, and the structure is seen through a warm haze. In an interesting video interview with James Bishop at this show, he talked about his early art school experience at Washington University beginning in 1950: the school was very conservative, starting students out drawing geometric solids and then slowly moving on to figure painting. Bishop said "I have never regretted starting at the beginning; you have to start somewhere." And: "the indispensible thing is seeing, and drawing is the best tool to do that". I see his nearly-hidden architectural structures as a paean to drawing as seeing. 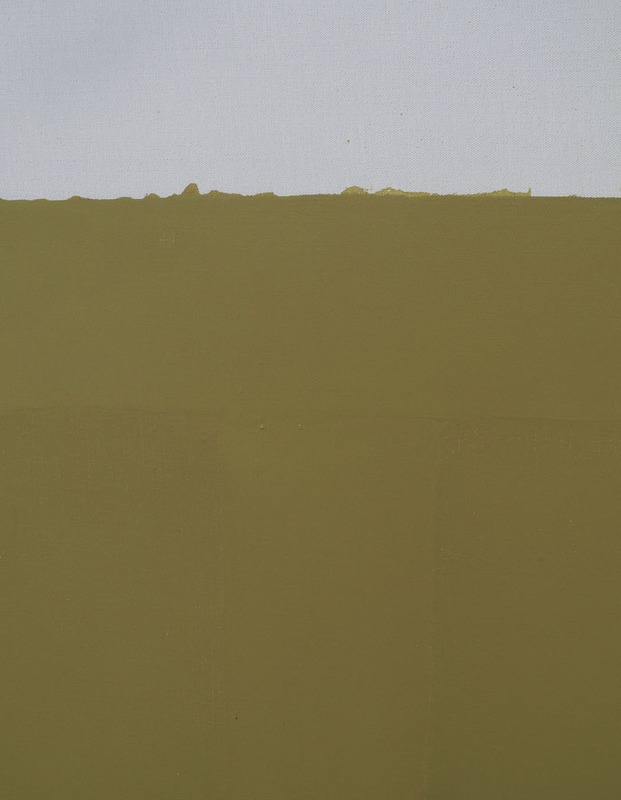 Early, 1967; oil on canvas, 76 5/8 x 76 1/2 in. In this earlier work color covers only half the canvas, with the structure of horizontal and vertical bars contained within it. 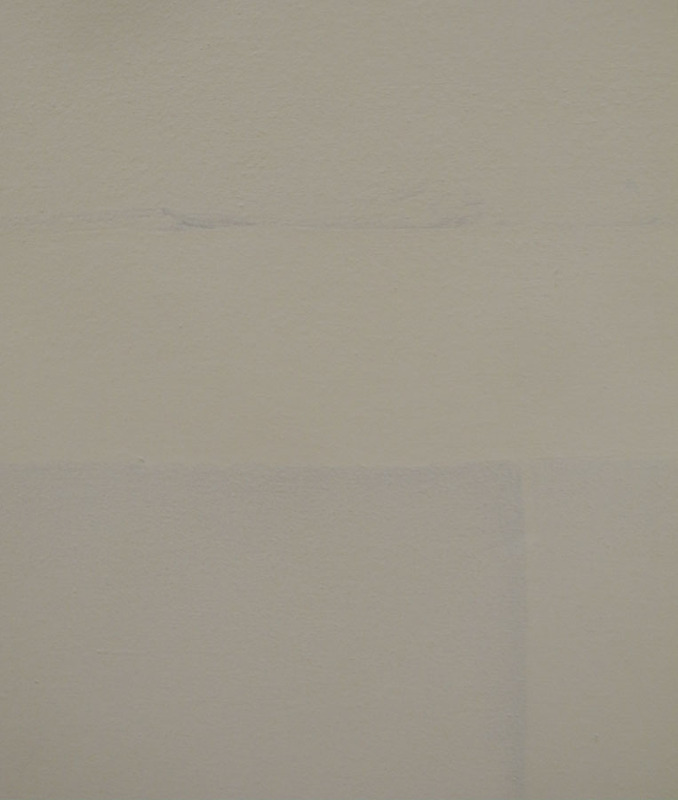 The painted edge is uneven, fluid, so the color seems to float above the white ground. 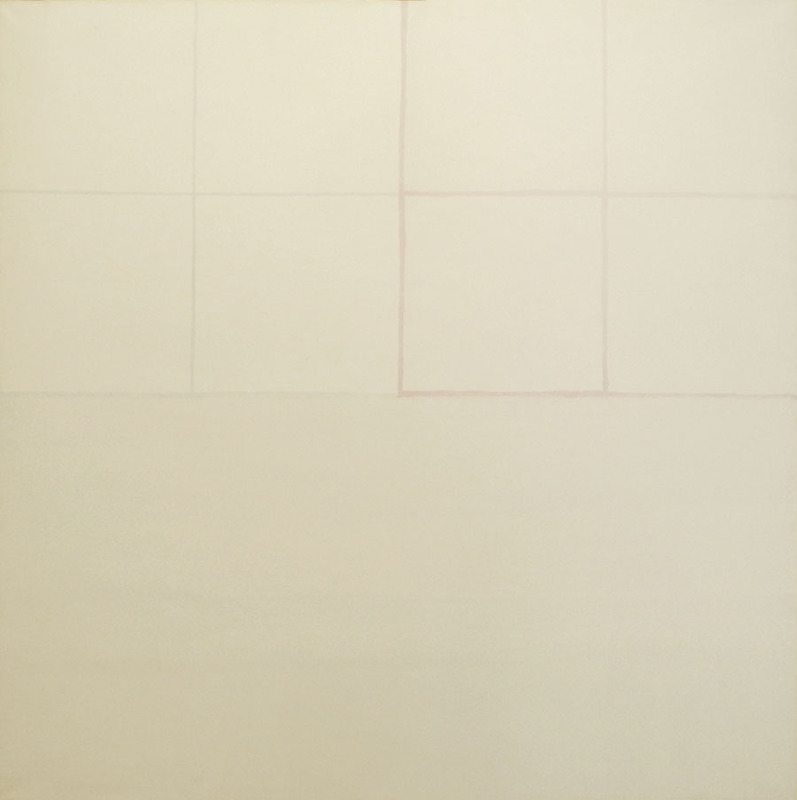 Having, 1970; oil on canvas, 77 x 77 in. The linear division in Having are more clear and present than the structures in the paintings above. And yet, they are still very subtly expressed, with the same quality of form within delicately colored light. Untitled, 1962-63; oil on canvas, 32 x 39 1/2 in. This painting has such zinging color relationships: the red and green in the center are quite harmonious as they sit atop the ocher, but then a surprising pinkish red tops it all off. I love the subtle and atmospheric color of Bishop's paintings of the '70s and '80s, but this painting points to another direction he might have taken. In the video interview linked above, when Bishop was asked if there were any painters who influenced him and could he name them, he replied that he couldn't because there were hundreds; he simply loved painting. Untitled, 2012; oil and crayon on paper, 5 1/8 x 4 3/4 in. 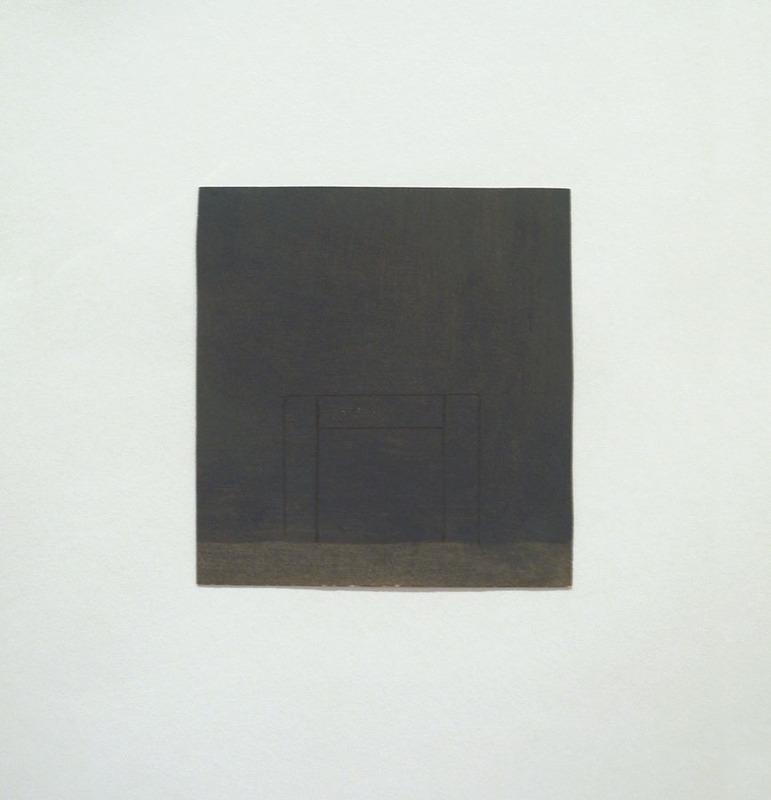 In 1986 Bishop turned away from the large square paintings on canvas and began to paint small works on paper. He remarked that "you surprise yourself more often on paper". 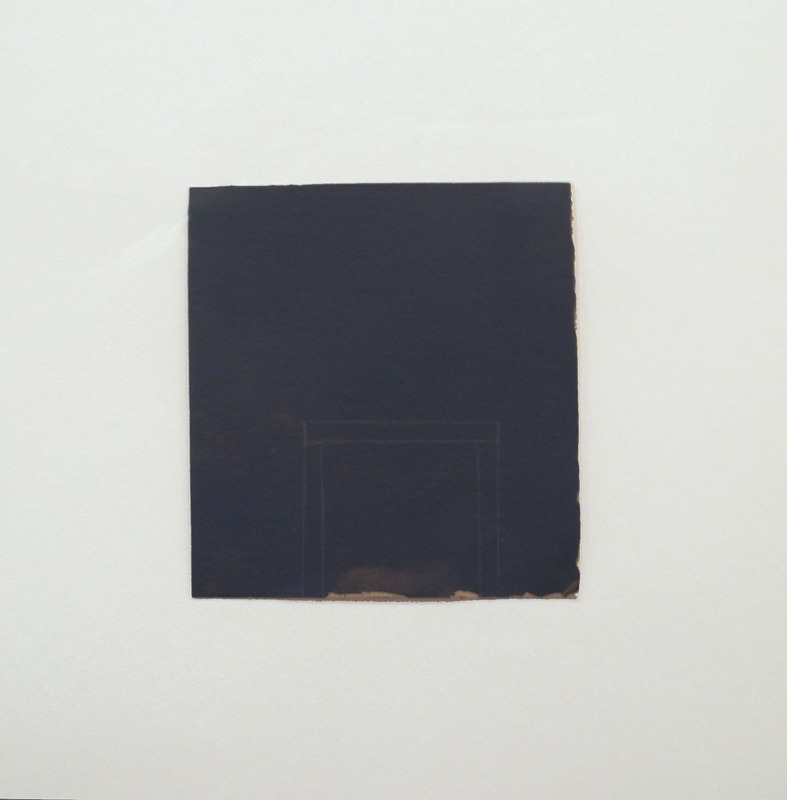 There were four very small works on paper in the show, each with a simple central structure. Untitled, 2012; oil and crayon on paper, 5 x 4 5/8 in. The sheets are irregular, the paint flowed on and not always covering the surface; the color appears embedded in the paper. With these small pieces, James Bishop has created a more intimate, meditative experience. With all his work, we must pay close attention in order to see what is there. I smilingly register my homage to your homage to his homage to so many homages to squares. ....and I pay homage to your nice comment, JBS. Thanks for the alert about Mr Bishop and his work. I enjoyed your words and the videos, interview and walk through. I'm struck about how his work seems to draw out of me a feeling of quiet. And I was struck with Mr Bishop's modest words about his work. I'm pleased that you liked the post and Bishop's work, James.